Huwaei chef financial officer (CFO) Wanzhou Meng arrest opens a new front in the US-China trade war. Daughter of Huawei is arrested on behalf of USA in Canada. Now she will be punished for 30 years said in news. The arrest of Huawei CFO has roiled all the business world and threatens to derail the thin between US and China. Chinese tech companies Chief Financial Officer (CFO) was detained in Vancouver on the request of US authorities. She went Canada to attend conference. She is accused by the US of helping Huawei cover up violation of sanctions on Iran by the sources of Canadian prosecutors, now she can be sent to US and may be jailed for 30 years. Why US doing it ? United States is saying that Huawei is such company who works against US interest. Recently, it is accused that the Huawei went against CATSA act under which company provides High tech telecommunication to Iran, Russia, North Korea because of United States interest hurt. China has called for release of Men’s through officials, Chinese tabloid Global Times said the US is just trying to stifle Huawei because of business competitor. Huawei has deployed services and products in more than 170 nations like US, Canada, UK where Huawei products are banned. In 2012 Huawei overtook ‘Ericsson’ as the largest telecommunication equipment manufacturer in world. It overtook Apple in 2018 as the 2nd largest manufacturer of phones only behind Samsung electronics. In next 4-5 years it will overtook Apple in revenue, it is estimated by expert. Reports from CNBC states that Huawei’s revenue in 2018 will exceed 100 billion United States dollars for the first time. The founder of Huwaei Ren Zhengfei is a former engineer in the Chinese People’s Liberation Army. So, it is suspicious issue that Huawei can steal data or spy information through their device. Why the action against Huawei ? From past couple of years, Huawei circumvented sanctions imposed on Iran and North Korea, providing these countries with telecommunication devices that can be used for spying over population. It could be dual use technologies. But major criticism surrounded with Huwaei’s growing influence in the upcoming years on global communications. It is fear in world that Huwaei company will provide technology in 5G wireless internet across the world. Why are developed countries banning Huawei ? In the year 2012, ZTE Corp and Huawei and another Chinese Telecom company we’re the subjects of an investigation that would look into whether their advice could possibly a threat to US interest. The US Congress concluded that ‘the Huawei ‘ company didn’t fully cooperate with the investigation and was not ready to explain it’s relationship with the Chinese government or CPC party of China while on the basis of evidences it fails to comply with US laws and banned by US, UK, Canada, Australia, New Zealand. These 5 countries also called as ‘5 eye‘. In country like India it is permitted. Japan recently totally banned Huawei company equipments. 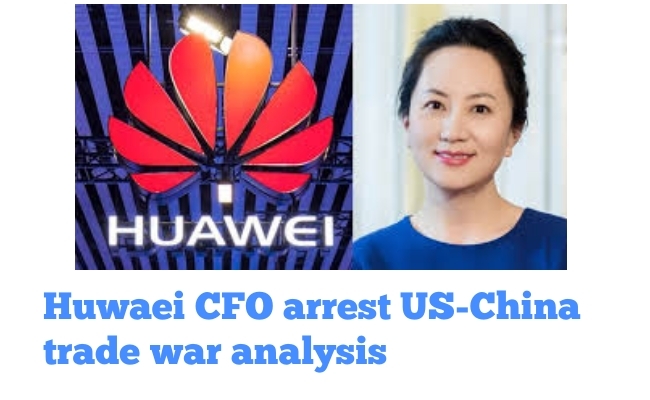 So, overall in the trade war of US and China, if China retaliate then………, But as we know when CFO of Huawei arrested then stock markets collapsed both sides. Let’s see only Time Will tell. We hope you enjoyed and acquired knowledge about Huwaei CFO arrest and reasons behind it.